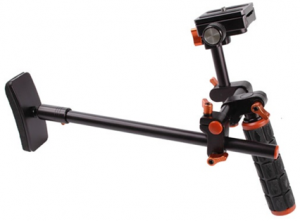 Here's a look at the new Motion9 folding DSLR Rig . 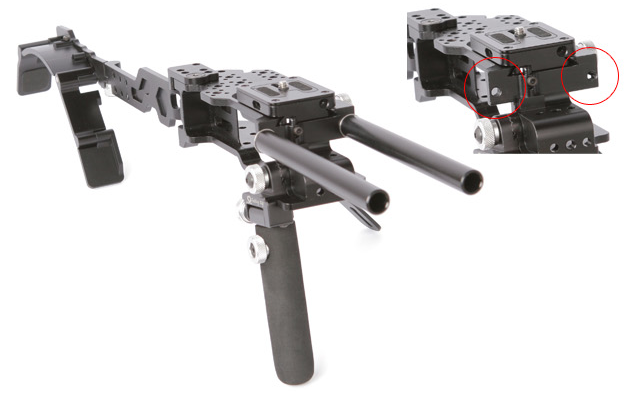 The http://www.ihmedia.co.kr company sent this review unit over for me to take a closer look at, and so we put together a short video of how this Motion9 Folding Shoulder Rig unfolds from a form factor about the size of a large battery grip. At first glance the Motion9 Folding Rig looks like an interesting concept, but since several additional parts outside of the main body are needed to complete the assembly, it's technically it's not as compact as you think. I'll admit that it's well made, and it doesn't feel cheap. The entire system is based on machined metal with a nice anodized black coating. I can see that the main focus of the product was to design something ultra-portable for travel, but there were just too many issues that would make it cumbersome for fast paced shooting. First off, even with practice, transforming the rig can take several minutes and breaking down after a shoot can take just as long. There are too many small screws and thumb knobs that I can already tell will easily get lost during a small production. The Motion9 VDSLR Compact Folding Rig will add mass and stabilize your shots, but because of it's limited adjustments it didn't feel quite balanced for me personally. The system is not based on industry standards, so forget about expanding with aftermarket accessories such as a replacement shoulder pad or perhaps a different top handle. The only areas that are standard are the short 15mm rails. I'll give them credit for not simply copying another idea and working towards a totally unique design, but I personally don't think it's a very practical system. Especially with a price tag of over $400 dollars, there are just too many other options for a compact rig, or options to simply build your own from standard 15mm clamps and rails. What do you guys think about this? What's your feedback on this product? 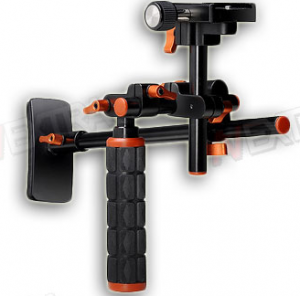 More photos and info about the Motion9 Folding DSLR Rig can be found on ebay (here). Posted in dslr stabilizer, dslr video, Equipment Reviews. 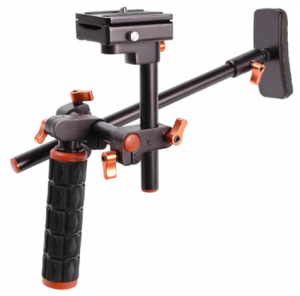 Tags: Compact Video Folding Rig, dslr video rig, Folding Camera Stabilizer, Motion9 Folding Rig, Pocket Rig, VDSLR motion9 on September 3, 2013 by Emm. At first release these rigs were going roughly around $120 dollars including shipping. If you're lucky you might be able to catch a few floating around the $90 price point. Right now there's a recent price drop bringing it down to just $64 dollars. It's a straight up close out deal, and I don't think you'll see this price again for a long while..Check out the target shooter style rigs following the link (click here). For updates like these, make sure you're following me on Twitter. Posted in dslr stabilizer. Tags: aputure rig, dslr video rig, magicrig, Polaroid DSLR, Polaroid Rig, Polaroid Shooter, target shooter rig on November 11, 2011 by Emm.